The last of their kind. Believe it. The truth can be hard to believe. It was once thought that there was only one last surviving Elastopod. Truly. This is ridiculous. There are 8. The Elastopod home world was destroyed when a starship carrying unknown alien artefacts exploded, obliterating the entire Elstopod home system. This was almost the end of the Elastopod race. Luckily the members of the Elastopod Special Forces Bravo Squad were on patrol in a ship at the far edges of their solar system. When their planet was destroyed Bravo Squad survived. Really. Making their way to the GCPS, Bravo Squad now plies their advanced military training on the neodurium pitches of the pro DreadBall leagues. They are a team to be feared no matter what some may say. Elastopods are not all bumbling goofs as rumor would have it. It’s unclear where that rumor began but the Sole Survivors are having none of it. Match after match the last of the Elastopods teach their opponents to respect Elastopods once again. 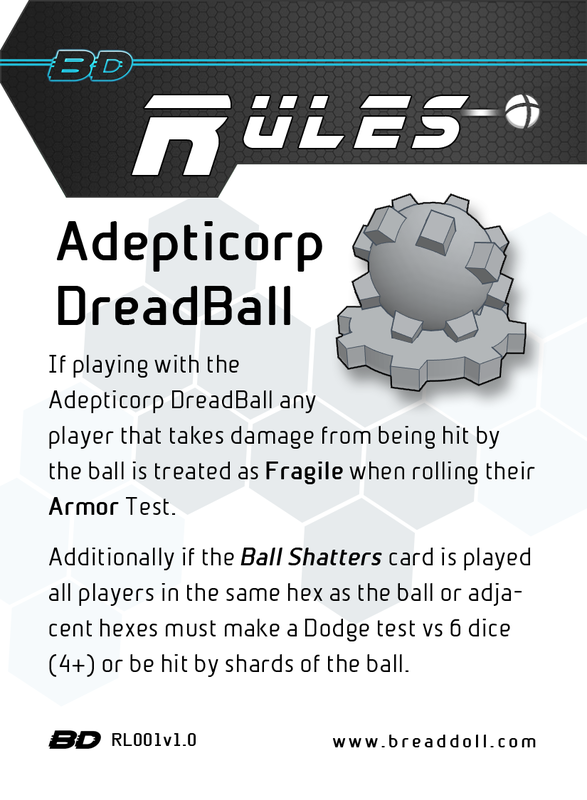 Rules: If playing with the Adepticorp DreadBall any player that takes damage from being hit by the ball is treated as Fragile when rolling their Armor Test. Additionally if the Ball Shatters card is played all players in the same hex as the ball or adjacent hexes must make a Dodge test vs 6 dice (4+) or be hit by shards of the ball. Rules: If playing with the Mark 2 DreadBall, the Ball cannot shatter. If the Ball Shatters Special card is played ignore it’s effect. Instead the player that played the card may look through the discard pile and take any 1 card they find there into their hand. The Mark 2 DreadBall is not only more durable, but also more aerodynamic with advanced gravity generators. When throwing the ball farther than 4 hexes treat all distances as 1 hex less. 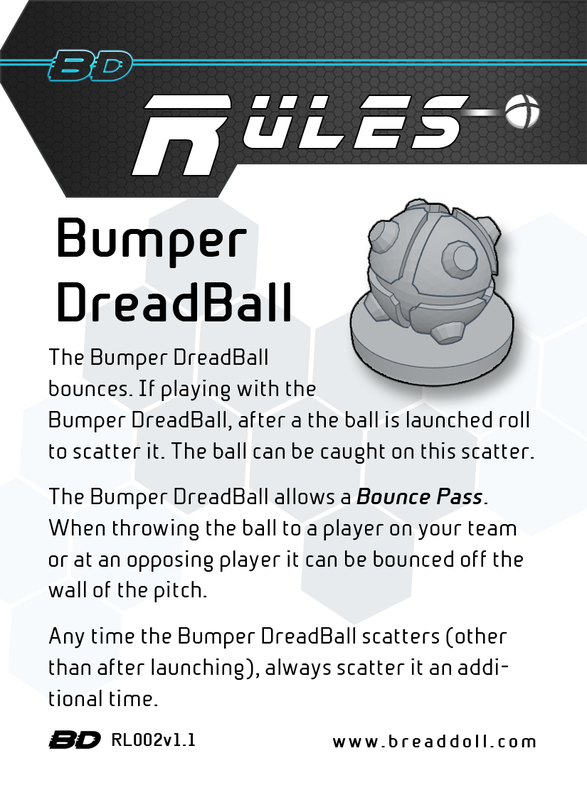 Rules: The Bumper DreadBall bounces. If playing with the Bumper DreadBall, after a the ball is launched roll to scatter it. The ball can be caught on this scatter. The Bumper DreadBall allows a Bounce Pass. When throwing the ball to a player on your team or at an opposing player it can be bounced off the wall of the pitch. Any time the Bumper DreadBall scatters (other than after launching), always scatter it an additional time. These alternative DreadBall and their associated rules can be swapped into any game of DreadBall for a bit of flavor and extra fun.